Despite rampant scientific innovation in nineteenth-century America, traditional medicine still adhered to ancient healing methods, subjecting patients to bleeding, blistering, and induced vomiting and sweating. Facing such horrors, many patients ran with open arms to burgeoning practices that promised new ways to cure their ills. Hydropaths offered cures using “healing waters” and tight wet-sheet wraps. Phineas Parkhurst Quimby experimented with magnets and tried to replace “bad,” diseased thoughts with “good,” healthy thoughts, while Daniel David Palmer reportedly restored a man’s hearing by knocking on his vertebrae. Lorenzo and Lydia Fowler used their fingers to “read” their clients’ heads, claiming that the topography of one’s skull could reveal the intricacies of one’s character. Lydia Pinkham packaged her Vegetable Compound and made a famous family business from the homemade cure-all. And Samuel Thomson, rejecting traditional medicine, introduced a range of herbal remedies for a vast array of woes, supplemented by the curative powers of poetry. Bizarre as these methods may seem, many are the precursors of today’s notions of healthy living. We have the nineteenth-century practice of “medical gymnastics” to thank for today’s emphasis on regular exercise, and hydropathy’s various water cures for the notion of regular bathing and the mantra to drink “eight glasses of water a day.” And much of the philosophy of health introduced by these alternative methods is reflected in today’s patient-centered care and holistic medicine, which takes account of the body and spirit. Moreover, these entrepreneurial alternative healers paved the way for women in medicine. Shunned by the traditionalists and eager for converts, many of the masters of these new fields embraced the training of women in their methods. Some women, like Pinkham, were able to break through the barriers to women working to become medical entrepreneurs themselves. In fact, next to teaching, medicine attracted more women than any other profession in the nineteenth century, the majority of them in “irregular” health systems. These eccentric ideas didn’t make it into modern medicine without a fight, of course. As these new healing methods grew in popularity, traditional doctors often viciously attacked them with cries of “quackery” and pressed legal authorities to arrest, fine, and jail irregulars for endangering public safety. Nonetheless, these alternative movements attracted widespread support-from everyday Americans and the famous alike, including Mark Twain, Louisa May Alcott, and General Ulysses S. Grant-with their messages of hope, self-help, and personal empowerment. Though many of these medical fads faded, and most of their claims of magical cures were discredited by advances in medical science, a surprising number of the theories and ideas behind the quackery are staples in today’s health industry. Janik tells the colorful stories of these “quacks,” whose oftentimes genuine wish to heal helped shape and influence modern medicine. Below the school name it read Corinne Newmann, the date, May 12, 1916, and her apparent specialty: water therapeutics. It seems my great-grandmother did. I soon learned that medical gymnastics is still around--we just call it exercising today. Swedish immigrants in Chicago founded the Kellberg Institute and offered instruction in the Swedish gymnastics system developed in the early nineteenth century by Swede Per Henrik Ling to promote health and healing. Ling developed a method of medical calisthenics after noticing how his own daily exercises had healed the joint injuries sustained from his strenuous fencing hobby. His regimen also incorporated massage; Ling is the Swede behind Swedish massage. The mainstream medical community did not exactly welcome Ling’s system with open arms--outright disdain for his presumption of medical knowledge might be more accurate--yet his system found widespread approval among the general public and a vast group of independent healers with their own divergent ideas of disease, health, and wellness. And yet we now take it for granted that exercise is fundamental to good health. 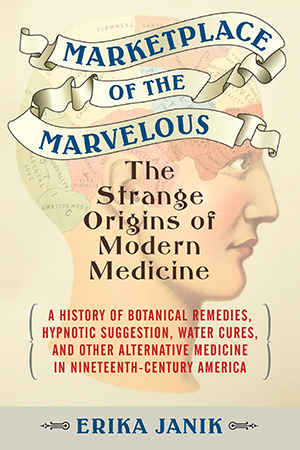 These questions led me deep into the history of what we would now call alternative medicine but what was often known in the nineteenth century as unorthodox or irregular medicine, and at less kind times, quackery. But the more I read, the more difficult it became to determine what was quackery and what was simply a bold innovation. Wading still deeper, I found nineteenth-century irregulars advocating cleanliness and diets of fruits, vegetables, and whole grains, prescribing medications with few side effects and made of natural ingredients, and hypothesizing on the connection of both the mind and body to one’s overall well-being--nothing that would seem out of place in modern discussions of health and wellness. At the same time, the more I read about mainstream, or regular, medicine--as it was known at the time--the less regular it seemed. Many of the therapies practiced by these doctors seemed at best odd, and at worst more quackish than the quacks. Bleeding, induced vomiting, blistering, and sweating, often to painful and sometimes deadly degrees, were the primary tools in the doctor’s bag. The reasons for prescribing bleeding over vomiting for any given patient seemed to depend more on the doctor’s inclination, training, or mood than anything we would recognize as sound evidence today. At the same time, regular doctors lampooned hydropathy’s concern for daily baths and regular water consumption, just as they had disdained Ling’s exercise regimen. The more I read, the more confused about these distinctions I became. These weren’t the stories I was used to hearing. Most accounts of early American medicine focus tightly on embattled doctors valiantly protecting the public from harmful--and even deadly--medical charlatans and quacks. The nineteenth century was not called the “golden age of the quack remedy” for nothing, right? But here were quacks advising patients to drink water and prescribing patent remedies with active ingredients that really worked. Calling one group regular and everyone else irregular seemed far too simplistic and even misleading. My own feelings of incredulity fit the tenor of the times. Hardeyed skepticism and zealous belief ran hand in hand throughout much of the nineteenth century. The era fairly throbbed with new ideas, technologies, and sciences, each seemingly more novel, unbelievable, and glimmering with possibility than the last. Few could resist giving at least some of these novelties a try. On a fall afternoon in 1873, writer and humorist Mark Twain arrived at the London offices of a fellow American. In town for a series of lectures, Twain had seen an advertisement for Lorenzo Niles Fowler, “practical phrenologist” and decided to investigate. Phrenology wasn’t new to Twain. He remembered the itinerant phrenologists from his childhood in Hannibal, Missouri, giving demonstrations and offering advice. These travelers were “popular and always welcome,” satisfying the townspeople with “translations of their characters,” he recalled. Nearly everyone received positive readings. “I still remember that no phrenologist ever came across a skull in our town that fell much short of the [George] Washington standard,” wrote Twain. Phrenology wasn’t new either, but by the 1870s, its massive wave of popularity had long since crested in the United States. Devoted phrenologists could still be found, though, courting true believers and those who perhaps just ardently wished to believe that character could be scientifically “read” on the skull and possibly even improved. Twain’s colorful report of his analysis in his Autobiography is the only remaining record of his visit; the original chart does not seem to have survived. Although he clearly twisted the results for a good joke, Twain, whose interests ranged “from protoplasm to infinity” according to one biographer, remained both dubious about and fascinated with phrenology, among other irregular healing methods, throughout his life, submitting to at least two other evaluations and writing phrenology into many of his stories and essays. In this fast-changing world, Americans wrestled with hope and doubt in their daily lives, but perhaps nowhere more than in matters of health. Nineteenth-century lives billowed with peculiarly named aches, epidemics, and invalidism: Quinsy. Catarrh. Bilious fever. Ague. King’s evil. Flux. Neurasthenia. Nearly everyone, it seemed, suffered. Abraham Lincoln shepherded the country through its great civil cataclysm while battling his own severe depression. Louisa May Alcott wrote Little Women and Little Men while suffering from what she believed to be the terrible effects of the mercury prescribed to treat the typhoid fever she contracted during the Civil War. Harriet Beecher Stowe experienced attacks of hysteria so severe that she remained bedridden for weeks at a time in the years before she wrote Uncle Tom’s Cabin. Charles Darwin wrote On the Origin of Species while confined to his home, a vigorous young man done in, according to his doctor, by “intellectual labour and moral anxiety” that turned him into a reclusive invalid by age thirty-three. Sickness, both physical and mental, was a major part of being alive. Large segments of the population suffered poor health most of their lives. Filth pervaded daily life. Water was often polluted. Food preparation and storage were unhygienic. Garbage littered streets and yards along with animal droppings and the bodies of animals that had simply dropped dead. Privies and cesspools overflowed. All created breeding grounds for mosquitoes, flies, and other disease-carrying pests. Malnutrition and poor housing, particularly in rapidly growing urban areas, only magnified health problems and spawned epidemics. Infants died of diarrhea and dysentery from contaminated food. Deaths from tuberculosis, scarlet fever, diphtheria, smallpox, and cholera occurred so regularly that they were considered a matter of course. Not every disease killed, though. Others simply made life exceedingly unpleasant and painful. But even when a sick American visited a regular doctor, he rarely received an effective treatment. Scientifically valid medical knowledge was limited, and modern methods to sort out effective from ineffective and even dangerous treatments did not yet exist. Doctors did not understand the role of viruses and bacteria in causing disease, how most organs functioned, or the significance of personal contact and insects in the spread of infectious disease. Most people, including doctors, rarely washed their hands and did not think twice about sharing forks and cups. Medical advances of the period tended to occur in areas of theory, classification, and diagnosis, but not cures. For the average patient, these advances offered little immediate benefit beyond fancier and sometimes more specific names for their malady. Doctors made diagnoses by asking questions, observing the patient’s appearance, taking the pulse, and examining, and sometimes even tasting, urine; few performed physical exams. Lacking both the understanding and the correct therapeutic measures, doctors could only respond to symptoms and speculate about the cause of disease. Regular doctors practiced a form of medicine known as “heroic,” a name that came not from the efficacy of the treatment or the prowess of the administrator but from the magnitude of the intervention. Doctors bled, blistered, and purged to draw disease from the patient. The most extreme form of bloodletting was venesection, in which a doctor would slit open a vein and catch the pint or two of blood in a bowl. Doctors also applied blood-sucking leeches and employed a spring-loaded device called a scarificator that delivered a series of moderately deep cuts to the skin from rows of sharp steel blades at the flick of a release lever; it was developed in the eighteenth century as a more merciful bleeding tool. Blistering involved placing hot plasters or irritating chemicals onto the skin to raise sores that were then drained. Doctors purged patients with large doses of medicines containing mercury, antimony, and arsenic. The effect was always drastic and noticeable. And it was just what patients wanted. Sick people in every time and place want to feel better and will seek out the treatment or healer that makes that desire a reality. Everyone could agree that heroic treatments did something. Emetics purged, diaphoretics sweated, bleeding bled and changed the pulse. These treatments instilled confidence in the doctor’s skills, and confidence could bleeding “worked” because it nearly always produced some change in the condition of the sufferer that could be interpreted as progress, though it might also have been a strong placebo effect or simply a different symptom brought on by difficult-to-control treatments that were prone to infection. Bleeding and purging could cause a patient’s blood pressure to drop by decreasing blood volume and oxygen delivery to tissues. Too much, though, could cause organ failure and eventually death. Blistering opened wounds on the skin that could become infected, particularly in these unsanitary times, and spread to the bloodstream, which could also cause organ shutdown and death. Leeches, on the other hand, are still used in medicine to remove excess blood, helping doctors do everything from preventing clotting to reattaching severed fingers. Heroic approaches to healing reflected contemporary thinking on how disease worked but also an ancient cosmology. Medical theory of the time held that external symptoms revealed the disease, so anything that changed symptoms was viewed as potentially useful. These ideas went back thousands of years to the Greek physician Hippocrates and the Roman physician Galen, who proposed that the body consisted of four humors (black bile, yellow bile, blood, and phlegm) that needed to be kept in balance to be healthy. Every person had his or her own temperament or mixture of humors that could be thrown off balance by a variety of factors, including diet, lifestyle, or environment. The symptoms that people complained of and associated with sickness were not the actual disease but a sign of an internal imbalance that needed adjustment. Fever, for instance, was believed to result from too much blood, so anything that could reduce or eliminate it, usually bloodletting, was viewed favorably. Most of the medicines in active use were also known for their harsh effects. Some we would now think of primarily as poisons, such as the derivations of mercury used to purge and sweat patients. Leading emetics to produce vomiting included ipecac, tartar emetic, and sulfate of zinc. Powerful laxatives to clear the bowels included calomel and the root of the jalap plant. Of these, calomel, or mercurous chloride, was among the most dreaded of drugs. Doctors believed that this powerful cathartic flushed disease from the body and stimulated the cleansing power of the liver. But as a compound of mercury, calomel was also toxic. Patients given doses over a period of several weeks developed swollen mouths, ulcerated gums, and uncontrolled drooling. A 1720 prescription for a patient suffering from swollen joints called for two doses of calomel, followed by bleeding twelve to fourteen ounces of blood. After a day of rest, the patient received two more shots of calomel, more than enough to cause acute mercury poisoning. Doctors considered the visible oral damage and extreme salivation proof that the calomel had worked by producing a physical response that differed from that of the disease. Horrible side effects were considered necessary evils on the path to health. Nature often had no answer for chronic illnesses, however. Even after surviving a disease, many people lived with compromised health for the remainder of their lives, as did Louisa May Alcott after surviving typhoid fever and its brutal, if well-intended, medical treatment. Disease became a part of life, and many people treated themselves for the aches and pains of everyday living. Do-it-yourself medical books, medical almanacs, and family recipe books abounded with recipes for healing salves, prophylactics, and popular herbal remedies. Many American colonists had brought their favorite manuals along with them, like Nicholas Culpepper’s The Complete Herbal or E. Smith’s The Compleat Housewife; Or, Accomplish’d Gentlewoman’s Companion. Treating yourself was more convenient and cost less than a visit with a doctor, if one could even be found within a day’s journey from home. For some, home care was a powerful way to democratize medicine and spread knowledge. John Wesley, better known as the founder of Methodism, was among domestic medicine’s biggest proponents. In 1747 he published Primitive Physick: Or, An Easy and Natural Method of Curing Most Diseases, his own low-cost and nontechnical medical manual that instructed users on how to turn kitchen staples into medicine. Onions, honey, and licorice could treat coughs; apple water, asthma; whey and raisins, nosebleeds. He also recommended the unusual application of toasted cheese as a bandage to staunch bleeding. For millions of Americans, these domestic guides functioned as primary care doctors. Armed with these guides, women served as “Dr. Mom” long before marketers invented the term. Since the earliest colonial days, women acted as their family’s doctor, nurse, and pharmacist, providing most home medical care and nearly all birthing assistance. Many women had an impressive knowledge of herbal remedies, traditional rituals, and preventative measures passed down through families, found in books, and gained through firsthand experience. The technical simplicity of contemporary medicine made it possible for women, and others who were at the time denied any formal education, to offer many of the same services as a doctor. Although these alternate healers, and alternate forms of health care, had long existed alongside doctors, many more Americans began to turn away from regular medicine in the nineteenth century. It was not so much that medicine had changed as that American culture had changed after independence from Britain. Early Americans demonstrated a stubborn attachment to the idea that every person possessed the common sense to take care of him- or herself. The conditions of life on a new continent had forced colonists to improvise and make their own way in a rough and challenging new environment. As a result, Americans became proudly self-directed, self-reliant, and confident in their own judgment. This did not mean that no one ever sought the advice or counsel of others but it did foster an environment that prized individual good sense. Breaking away from British control only bolstered American confidence in the power of personal freedom and a concomitant distrust of authority, elitism, and control. The rise of Andrew Jackson, a poorly educated man from the backwoods of the Carolinas, to the presidency in 1828, seemed, to many Americans, to herald the triumph of the common man, equality, and democracy in the new country. The Jacksonians denounced the moneyed aristocracy and espoused a democratic ideology predicated on equality, although this equality remained restricted to white males. Under Jackson, free white men finally earned the right to vote as rules requiring property ownership fell. Celebrations of democracy and the right of the people to have a say in all aspects of life shot through popular culture even as the Jacksonian policies simultaneously supported sexual, racial, and ethnic subordination and exclusion. Slogans such as “knowledge is power” and “knowledge, like money, depends on circulation” became the catchphrases of the day. New technology made print cheaper, so books and newspapers proliferated. Public libraries, political parties, and associations devoted to literature, science, and philosophy encouraged the spread of ideas. This democracy of knowledge covered a wide range of topics, including health and science. These events and institutions spurred an egalitarian ethos among many Americans that clashed with the exclusivity of medical knowledge and skill claimed by regular medicine. The growing feeling that people could decide for themselves was not limited to medicine. Democratization significantly reshaped religious attitudes as well, as nineteenth-century evangelicals like Charles Grandison Finney, Lyman Beecher, and Francis Asbury focused on sin as a human choice rather than an inherent part of human nature. With salvation no longer left in God’s hands alone, an individual could save her soul by turning away from sin to embrace moral action and God’s grace. This emphasis on personal choice opened the door to new religious groups like the Latter-day Saints, Millerites, and Seventh-day Adventists who questioned religious orthodoxy and offered more contemporary and personally empowering alternatives as they competed with older denominations for adherents. Other people and institutions seized on the democratic impulse to propose social innovations that they hoped would usher in a better world. All of the transformations remaking the nation promised so much hope but came laden with challenges. Poverty, lawlessness, and overcrowding gripped city and town alike. Inequality persisted. To solve these problems, reform organizations dedicated to sanitation, abolition, dress reform, vegetarianism, and countless other issues formed around the country. Utopian communities like the Transcendentalist Brook Farm in West Roxbury, Massachusetts, and those of Robert Dale Owen at New Harmony, Indiana, and John Humphrey Noyes at Oneida, New York, attempted to remake society. Most of these communal experiments disintegrated quickly, but these reform efforts nonetheless raised expectations about the possibility of perfecting both human nature and its institutions. All of these disparate reform efforts shared one overriding goal: to match American reality with American ideals. Early Americans evinced a remarkable faith in the boundlessness and perfectability of the nation. The path to perfection naturally began with the individual. Ralph Waldo Emerson counseled, “Nothing can bring you peace but yourself. Nothing can bring you peace but the triumph of principles.” Reformers of all kinds encouraged Americans to work toward the perfection of their individual lives, believing that this would have a cascading effect that uplifted all of humanity. In this dynamic environment, it’s hardly surprising that irregular medicine flourished. When these systems first arose, the country’s medical marketplace was already among the most varied in the world. Medical practice in the eighteenth century had been loosely organized and lightly regulated, an activity in which just about anyone could--and did--participate. All tastes and budgets could find a medical system to match. People relied on doctors as well as midwives, lay healers, herbalists, and Indian doctors skilled in the use of native plants. Ministers, often the best-educated people in a community, received frequent calls to heal the body as well as the spirit. Trained doctors were in short supply. The problem was particularly severe in the South and the West as people moved farther and farther into the frontier. Before the telephone, a doctor had to be summoned in person. A farmer traveling eight miles to town for help could lose a whole day of precious work. Even then, there was no guarantee that the doctor would be home. As a result, responsibility for medical care often fell on the sick themselves. Irregulars identified regular medicine with overly aggressive therapies based on old and speculative ideas. They derisively nicknamed regulars “drug doctors” and “knights of calomel and the lancet.” Bloodletting and heroic dosing--and in many cases, drugs altogether-- were virtually banished from most irregular practices. Irregulars claimed that common sense and their experience with an alternate form of healing--often gained through some kind of conversion experience-- had completely discredited regular medicine’s damaging and depletive therapies. Most relied on natural remedies and proclaimed nature the source of both the strongest treatments and the most effective preventative medicines. They presented their case to Americans in simple and direct language that reinforced the era’s widespread belief in intuition, practical sense, and accessible knowledge, while exploiting regular medicine’s weaknesses. Irregular doctors were no more equipped to cure than regulars, but their treatments tended to be milder, cost less, and cause fewer side effects. The proliferation of medical systems and alternative routes to wellness spoke to the lack of scientific advancement and to American hunger for new and potentially more effective treatments. Irregulars speculated on the cause of disease and devised coherent and unified theories that made sense of many confusing and often vague symptoms. They promised a clear path to health and wellness. In many ways, irregulars could make greater claims to scientific authority than regular medicine. Most based their theories on their own observations and experimentation, a method generally considered the most modern form of scientific induction of the time. Irregulars observed the effects of certain drugs or procedures and then made claims based on what they saw. They even got a few things right. Stories of medical men grave robbing for anatomical material and dissection also did little to win public favor to the medical profession. One of the most notorious incidents occurred in New York City in April of 1788 when medical student John Hicks allegedly waved a cadaver’s arm at some children peering through the window of a hospital dissecting room. Hicks then called out, “This is your mother’s arm! I just dug it up!,” likely unaware that one of the children had recently lost his mother. The boy ran home and told his father, who exhumed his wife’s coffin and found it empty.